What kind of thoughts and pictures do you have in your mind? Full of doom and gloom? Do you talk to yourself in your mind in a way that’s not very encouraging or helpful? Do you beat yourself up in your head when things don’t go 100% as you planned them? Do you envision a disaster around every corner? A tragedy at every turn? A catastrophe as soon as you get up in the morning? A nightmare the minute you leave the house? Are you dreading the coming working day for all the problems that you know will arise? And are you not looking forward to going home because that’ll be even worse? “It’s a nightmare!” when your printer has run out of toner. (This is definitely not a nightmare, it’s annoying at the most). “I’m rubbish at this!” when you’ve tried something for the first time. (You might not have achieved the result you imagined, but, hey, you’re new at this. Criticism isn’t going to help you improve). “Oh no! I can’t drive in this weather because I’m sure to crash and die!” when thousands of other people are getting safely from A to B at this very moment. (Thinking like this is unhelpful and not going to improve your driving skills). A lot of us love to use a bit of drama in our language to spice it up a bit (I’ve got my hand up here) but do you realise that your subconscious mind is listening to all this all the time? It thinks you want disaster, catastrophes, tragedies, nightmares, doom and gloom and all the other negative things. And, like the Universe, your subconscious mind will help you to manifest these things into your life, just as you “wished”. It doesn’t CARE what you tell it. It’ll do as it’s commanded. Like a loyal dog trained to fetch you a certain toy. Or the genie in a magic lamp. That’s because it’s part of our primitive brain – the part we’ve inherited from our stone age ancestors. It hasn’t changed in thousands and thousands of years. It’s only concerned with our survival. It’ll put us into fight, flight or freeze mode at the drop of a negative thought. At the conjuring of a gloomy picture. Leading to an increase in the level of our stress hormones. Even if we’re not in real danger – we’re simply thinking of the possibility of danger or using vocabulary that implies danger to our subconscious mind. The good news is that because our subconscious mind doesn’t care what we tell it, we can easily replace those negative thoughts and pictures with positive ones. Even if we don’t believe them (yet) with the part of our brain that developed much more recently – the logical brain. Our primitive brain, where our subconscious mind lives – and which is the boss of our behaviour and habits – will happily take on and accept the positive thoughts and pictures (think: loyal dog). It’ll take them on and accept them as your reality, even if we haven’t achieved the content of our positive thoughts and pictures yet! They will be blindly followed as reality, or as a way to push towards achieving them as your new truth. Once you know this, it’s like winning the lottery because you can totally change your life around! So, watch out for the words and images you use. Catch yourself being negative and rephrase it to something less dramatic or something positive. When you’re about to use doom and gloom vocab – STOP! – and look for the good in the situation. If you’re about to join in with the Moan And Groan Society – HALT! – walk away and become aware of what you can appreciate instead. And let’s go a step further, while we’re on a good streak! Why not PRAISE yourself (in your head or in a journal) and praise others instead of criticising? 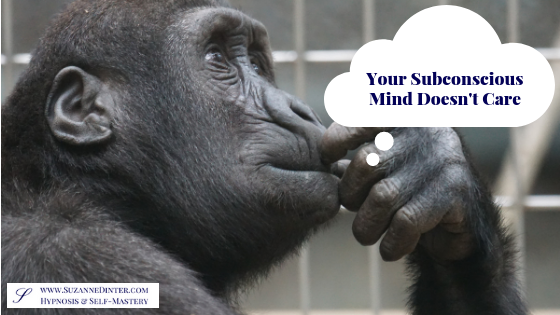 Remember: your subconscious mind doesn’t care – negative or positive. You’ll be amazed at how it can turn your perspective and your life around. I can assist you in changing your thoughts and pictures into positive ones, especially if you think there is a block preventing you from doing this (like an upbringing by negative or critical parents). Hypnosis taps into your subconscious mind, regression can find out where the thing you want to change comes from, and other powerful techniques can help you to forgive, find closure, heal and many other wonderful things. 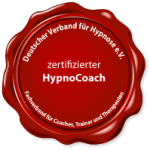 If you’re looking for long-term transformation, hypnosis is the key. Whenever you’re ready, please book a free, initial consultation call here. Great blog as always Suzanne! I think we can all relate to being drama lovers occasionally but you’re absolutely right – it can be incredibly powerful to turn this round. Thinking printer disasters (and who doesn’t have them) … to instead think – oh wow despite running out of ink I managed to get some more and still print the document on time sends a much more powerful message. Than I’ve run out of ink it’s a total nightmare! What a great article Suzanne! I totally agree with you there. Our mind is a powerful tool which we can certainly use to our advantage.